The following description should give you guidance on how to build a mobile antenna for HF bands yourself, using a very cheap CB-mobile whip antenna base. buy a black CB mobile whip, abt. 160mm long, with helical wire and adjustable top. remove all black plastic cover from the glasfibre stick. remove the helically wound copper band from glasfibre structure by cutting. clean soldering points on bottom and top section of antenna. solder the new wire onto previously cleaned supports on both ends of your antenna. mount the antenna on your car and check the resonant frequency, using an MFJ antenna-analyser or your HF-transceiver with very low power. 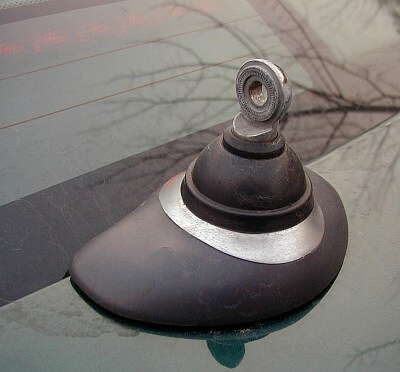 mount the antenna to your car and measure the resonant frequency for lowest SWR. It should show low SWR above 29 Mhz, when the insulated wire is installed and shortcuts the helically wound copper coil. now disconnect the insulated wire from top and solder it to the middle of the antenna. Make surre you scrap of existing insulation from copper wire before soldering. You have now measured 3 different frequencies and so you schould be able to identify all other tapping points for each band. cover now each section from bottom to top with blackÂ shrink tube and solder connectors for tappings. After all your antenna should look like my example here and work fine on all bands , even WARC or MARS. maximum power is about 150 to 200 Watts. Slim design is preferable in Europe and Japan, in order to avoid beeing an attraction. For operationa good grounding is important ! I am using the bracket you can see in the picture, mounted on the trunk of an AUDI A6. Nearly no dammage is donne to the car and cabel is entering the vehicle through the rubber lid of car trunk. Here you can see a grphic of the principle of operation. The concept is based on a helical coil that gets shortcut in some sections for different bands. It is important to shorten from bottom to top, in order to maintain good efficency and high Q and good radiation.Highest current flows in the lower section of the antenna. No additional tuning device is neccessary. Some cheap and easily available connectors can be used to perform the tapping of the coil. 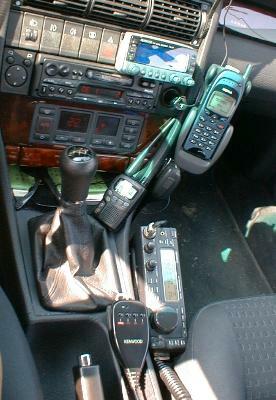 However, for band switching you have to stop the car. 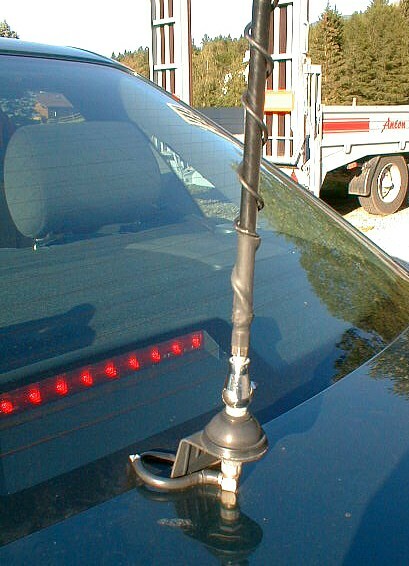 I am interested in making this antenna. Just a couple questions. 1. The overall measurement of cb antenna seems short. 160mm? 2 if the tight windings are insulated how do you tap?